Alright, alright, alright! You might notice a little change around here. Last January (2017) I had decided I was going to go all in on my writing career. I’d been writing and publishing books for a few years before that, but I hadn’t been doing it full time or investing a lot of money into it. One of the things you learn as an independent author is that writing is exactly like a small business — you have to put money into it. Sure, there are lucky authors who manage to snag success just by publishing, but success stories like Hugh Howey’s are becoming a lot less common, in part because there’s just more competition out there for reader’s attention. That meant I had to treat my career as an investment. One of the first things I did was invest in a web presence. I paid for hosting services, registered a domain name and purchased a few themes to customize my website. It looked passable, but I was never thrilled with it, partly because the themes you could purchase had odd restrictions (don’t get me started on static image sizes that nowhere in any documentation was it written what the ideal sizes needed to be) and were extremely inflexible. Add to that the support for the themes wasn’t the greatest. An update to a theme I was using caused me to be unable to add new content to my website for over a month. Now, I should add, there won’t be technical support in the traditional sense. If authors who want a site like mine say, “it would be nice if …” and it’s something I think is a solid idea, I’ll pass it along and see if it can be easily done. I’ll write up some basic documentation and I’m going to add some free images and theme settings to get people started so they can get an idea of how flexible this theme is and what they can do with it. Authors who are interested would also have to purchase a plugin called Advanced Custom Fields Pro – I got this for about $22. My developer is in no way associated with that company or plugin, he just uses it as a boilerplate element of all of his custom WordPress themes and plugins. Eventually it will be downloadable from my site, but it you’re interested in jumping on board during the beta, just fire off an email to me at mmperry@authormmperry.com and I’ll send you the theme. Now, onto other news — my new book, Enchanted Legacy, is coming out in less than two weeks! 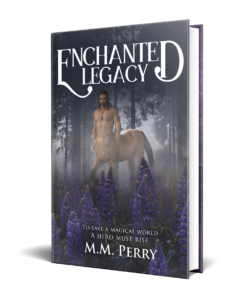 You can pre-order Enchanted Legacy now for $0.99 and, if you’d like to, you can read the first three chapters here. No sign-up is required to read the first three chapters. You might see a few minor editing issues — those have been fixed for the final version. Enchanted Legacy is a standalone portal fantasy. If you’re unfamiliar with the term portal fantasy, think of books like Through the Looking Glass, Outlander or Stardust. Enchanted Legacy follows a young woman named Fiona. Fiona is a modern woman living in our world. Her grandmother, the woman who raised her, unexpectedly dies and leaves behind a mysterious letter with a vague request — ride her grandmother’s horse where it takes her and aid her ancestors. What Fiona thought was merely the mending of a family rift turns out to be something much more magical and dangerous. She is transported to a world where creatures from myth and legend are real. She soon finds she’s inherited so much more than just a quest. She’s inherited a legacy – one she’s not so sure she’s worthy of. I’ll leave the price at $0.99 for the first week of release. So far my ARC readers have been sending me rave reviews. I’m super excited to release this book. It has some of my favorite characters from anything I’ve ever written. This is also the book I’m planning to enter into SPFBO this year — I’m mentioning that now because I’m really hoping to bring out another fantasy this year, the first in a short series, but more on that later 🙂 . I hope everyone is having a productive, happy and healthy year so far. I’ll blog again soon when Enchanted Legacy is released!